As environmental and energy issues have become increasingly aggravated in recent years, photovoltaic (PV) cells are drawing attention as a new energy source. However, since the cost of silicon PV cells is still high, it's important to reduce the cost of PV cells. 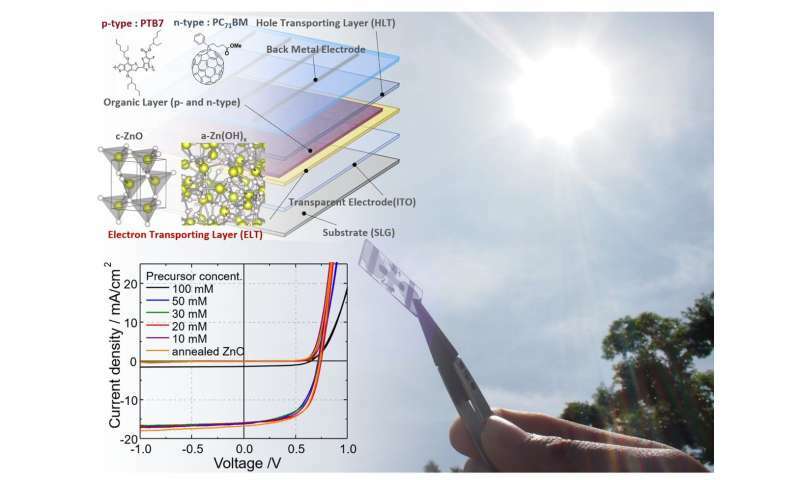 On the other hand, organic photovoltaic (OPV) cells using organic compounds have several advantages: they are lightweight, flexible, and sophisticated, and their production cost is low. For these reasons, they are anticipated as next-generation PV cells. One of the authors Tohru Sugahara says, "We succeeded in forming nano-sized oxide ultra-thin films by our blended solution coating method without heating." The thickness of this ultra-thin film can be controlled in the range of 5—100 nanometers. They created OPV cells using this film making technique, achieving the highest PCE under the use of an ultra-thin film of about 20 nm. This technique not requiring heating in the forming process of ZnO thin films will be able to drastically reduce the production process and cost.